"It is not known how Coomaraswamy and Crowley met, but they had a substantial relationship while Crowley was living in New York City in 1916. Coomaraswamy asked Crowley to help promote his wife Alice Ethel's performances in 1916. Crowley wrote reviews of her in Vanity Fair and offered letters of introduction for her. She and Crowley quickly became lovers and magical partners, engaging in sexual magic by April of 1916. Alice became pregnant. Crowley [whose version was of course partial--Ed.] says that Coomaraswamy was quite aware of their affair and had even encouraged it, wanting Crowley to take on her living expenses while in New York. Crowley, in exchange, introduced Ananda to Gerda Maria von Kothek, a prostitute and former Crowley lover. Coomaraswamy and von Kothek were soon living together. [Again according to Crowley--Ed. ], when Alice Ethel's career began to take off, Coomaraswamy wanted her back. Alice Ethel loved Crowley, but, for whatever reason, decided to return to England with Coomaraswamy. She had a miscarriage as a result of sea sickness on the voyage. Crowley blamed Coomaraswamy for the death of his child and hated him for it." Crowley was an important member of the Golden Dawn, which he had joined in 1898, but left the order well before this period. Crowley served as the right-hand man to the head of the order around 1900, during which time a schism occurred in the order, leaving W.B. Yeats as the head of the London faction. Crowley also experienced a loss of faith in Mathers. This effectively left Crowley out of the GD after 1900. Crowley later claimed to have made legitimate contact with the Secret Chiefs that governed the order, thereby making him the head of the GD. He then claimed to destroy the order as it existed and, in 1906/07, reconstituted it as the AA, a successor order with a very different organization. If you accept Crowley's claims, then he was technically the head of the GD, but not of the group and people to whom you refer. By 1914, the period during which you speak of "Crowley's Golden Dawn", Crowley had long ceased to associate with that group. He was, by then, the head of the AA and the British section of the Ordo Templi Orientis, a masonic group to which Gerard Encause had belonged. So, while Coomaraswamy and Crowley knew one another very well, they did not meet through Yeats or the Golden Dawn. Ivan Aguéli (born Johan Gustaf Agelii), the Swedish painter who introduced Guénon to Sufism in 1911, is of course the most famous Swedish proto-Traditionalist--"proto" because he died before Traditionalism was really established. However, there have also been later Traditionalists in Sweden, the only Scandinavian country in which Traditionalism has really developed. The earliest Swedish Traditionalist was Kurt Almqvist (1912-2001), a poet who joined the Maryamiyya during the 1940s. Almqvist published in Études Traditionnelles during the 1960s, and then in Studies in Comparative Religion during the 1970s and 1980s. He also published extensively in Swedish, both volumes of his own poetry and Traditionalist works such as Den glömda dimensionen (The forgotten dimension, 1959) and Tidlös besinning i besinningslös tid, Ur Frithjof Schuons verk (Timeless meaning in a meaningless time: From Frithjof Schuon's work, 1973). A later but better known Traditionalist was Tage Lindbom (1909-2001). Lindbom started as a socialist, working as a theorist and archivist for the governing Sveriges socialdemokratiska arbetareparti (Social Democratic Party, SDP) after taking his PhD (on the history of Swedish syndicalism) in 1938. He discovered Traditionalism in the 1960s, published Sancho Panzas väderkvarnar (Sancho Panza's windmills) in 1962, and left the SDP's employment in 1965. He and Almqvist became the center of a small, mostly intellectual, group of Swedish Traditionalists. Lindbom published numerous books and articles, of which the most important was probably Agnarna och vetet (Chaff and grain, 1974), which has been translated into English, French, Spanish and Turkish. He became increasingly prominent as a Swedish spokesperson for conservatism, with books such as Demokratin är en myt (Democracy is a myth, 1991), translated into English as The Myth of Democracy. Towards the end of his life, the group around him is said to have become less intellectual, and to have divided into two segments: young Swedish Muslims of immigrant origin, and young Swedish ultra-conservatives. After the death of Almqvist and Lindbom, the two most prominent Swedish traditionalists became Ashk Dahlén (b. 1972) (of the Royal Swedish Academy of Letters, History and Antiquities) and the journalist Mohamed Omar (b. 1976). According to Dalil Boubakeur [rector of the Grand Mosque of Paris and president of the Conseil français du culte musulman] . . . "General de Gaulle was a personal admirer of Guénonian thought." This is the first I've heard of it, but Boubakeur is not the sort of person to make baseless claims. Well, the claim seems to have an origin, if not exactly a base. According to Jean-Pierre Laurant in René Guénon: Les enjeux d'une lecture, Jean Robin alleged that de Gaulle had been initiated by Michel Vâlsan in the gardens of the Élysée palace. Robin also alleged, it seems, that Guénon prefigured the Mahdi (pp. 318-19). Laurant describes both, politely, as "adventurous speculations." We still have Boubakeur himself as a Traditionalist, though. Valentine de St.-Point, Guénon's friend and associate in Cairo, was more important as an artist than I had thought--mostly for her 1917 performance of Metachorie at the Metropolitan Opera House in New York, and as the only female futurist. For the 2009 PERFORMA in New York, marking the Centenary of Furturism, Adrien Sina and RoseLee Goldberg are proposing a multi-media symposium, "Valentine de St.-Point: Tragédies Charnelles. Performance, Dance, War, Politics and Eroticism." Günter Berghaus, "Dance and the Futurist Woman: The Work of Valentine de Saint-Point (1875-1953)," Dance Research: The Journal of the Society for Dance Research 11, no. 2 (Autumn, 1993), pp. 27-42. Leslie Satin, "Valentine de Saint-Point," Dance Research Journal 22, no. 1 (Spring, 1990), pp. 1-12. Nancy Gaye Moore, "The Hermetic Dances of Valentine De St.-Point (1875–1953)," Proceedings of the Society of Dance History Scholars Twenty-second Annual Conference, University of New Mexico, Albuquerque, New Mexico10–13 June 1999. Nancy Gaye Moore, "The Convergence of Orientalism and Parisian Occultism in the Dances of Valentine de St.-Point (1875-1953)" Supplement to the Proceedings of the Congress on Research in Dance held at NYU, October 26-28, 2001. 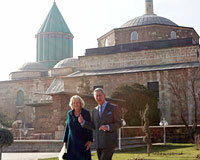 Prince Charles enjoys reading Rumi, according to his office's press release after his second visit to Konya, on November 26, 2007. His other visit was in 1992. If we hope to create a more sustainable way of living with the grain of Nature rather than so destructively against it then, surely, it is only with our innate sense of the sacred intact ... The natural World, indeed the entire Universe, is rooted in and bound together by wholeness... By seeing the external and material world as the only reality, the modern industrialised world view too often considers “the part” to be “the whole.” But, in so doing, not only does it falsify the whole, it also diminishes the part... We, too, are a microcosm of that organism and our separation from it becomes a profane act with profane consequences in today’s fragmented, conventional ideology. The speech was poorly received by the audience. As a result of confusion in the office of the mayor of Konya, the audience consisted mostly of schoolchildren. PS for Daniel Pipes, who has been exploring the possibility that Prince Charles is a secret convert to Islam periodically since 2003: it is more complicated than that.